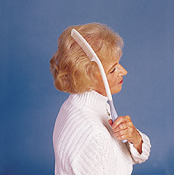 The Long Handled Comb is a wonderful grooming essential for Stroke survivors, people with Arthritis, or people with difficulties grasping and reaching above the shoulders. 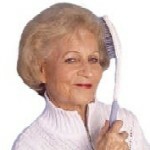 The longer handle allows you to readily reach even the back of your head to comb your hair. The ergonomically designed handle contours to allow for a soft, comfortable, and secure fit in your hand while wet or dry. The comb is 15.5 inches long and the wide tooth portion of the comb is 4.25 inches long.